I think we can all agree that we’re captivated by diamonds simply because of THE sparkle! No other gem can radiate like a diamond does. It’s like a reachable, wearable star that connotes a timeless bond. And the head honcho behind this mesmerizing shimmer is what we call the “Diamond Cut”. Now, a lot of you may have heard of round cut, princess cut, and other diamond shapes that are tailed by the word “cut“. Well, it’s just like a childhood nickname you can’t get rid of! But that’s not really what Diamond Cut is all about. What I mean by Cut is the proportions of the diamond that determine its level of sparkle. Or in gemological terms: its fire, brilliance, and scintillation. (You’ll be seeing these terms down the line, so better get used to it. 🙂 ) While the Diamond Shape only refers to the outline of the stone. Unlike the superficial impression on diamonds and the in-your-face depiction of shape, the diamond cut is technical, measurable, and adjustable to maximize your gem’s brilliance! In fact, the cut is the ruler of the Diamond 4Cs – cut, color, clarity, and carat weight. 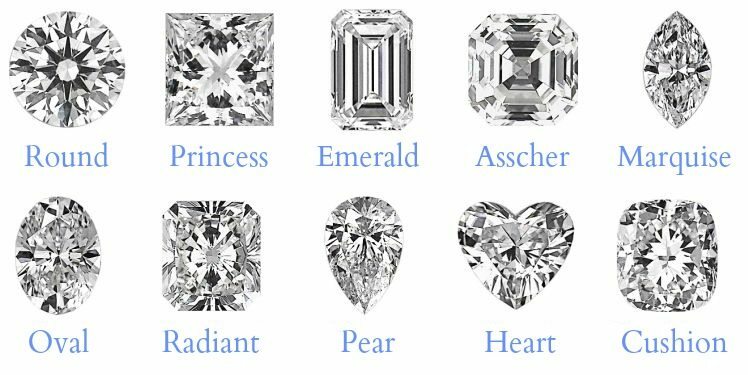 Before I begin, please bear in mind that the diamond cut only refers to the proportions of the round and princess cut gems. Therefore, you will not find any cut grades for other diamond shapes. Now, the picture on the left depicts the relationship between various facets and angles that play as decisive factors in determining the diamond’s cut. A proportioned cut will let the light traverse through the diamond in such a way that it will be reflected back to the viewer’s eye and give boost to the other 4Cs. Fire – The light dispersion that appears as flashes of rainbow colors. It’s beautifully seen on darker environments like at a candlelit dinner. Scintillation – The pattern of dark and light facets that intensely sparkles when the diamond is moved. It’s usually seen in office lighting environments – opposite of where fire can be seen. By clicking the images, you can actually view the diamonds from all sides and see how they differ in light reflection. The one on the left is within super ideal cut proportions and exhibits a lot of sparkle. The diamond on the right however, looks much less lively and exhibits considerably less sparkle. Another important factor in deciding how well the light will reflect back to the viewer is the pavilion angle. If it’s too shallow or too steep, it will then cause less light return. Apparently, everybody wants brilliance (white light) and fire (rainbow color light) in a diamond. But if for instance, you have a preference for fire, you can deliberately choose one that maximizes fire. In such a case, you would have to find a so-called “fiery ideal cut diamond”. The diamond on the left exhibits much more fire than the diamond on the right. The second gem looks great, but it is maximized for brilliance and not fire. Of course, you will only be able to see the difference if you view them from all sides just as you would in real life. What the examples above are meant to show you is how much of an impact the diamond cut has that it should be your absolute priority in choosing a diamond. You may compromise on everything else, especially on color and clarity, but you should never compromise on cut! So, Why Do Poor Cut Diamonds Exist? You would think that people wouldn’t be interested in buying poor cut diamonds where fire, brilliance, and scintillation hardly exist. After all, this is what we buy diamonds for! Obviously, people will pay the most attention to the carat weight as it’s usually the first thing you’ll be asked about upon being engaged. Thus, the prices sharply increase for bigger carat weight than for a better cut. For this reason, many diamond cutters are intent on preserving as much weight during the cutting process. If a cutter produces a deeply cut gem, more weight will be hidden in the diamond. And it will drive the carat weight and the price higher! Yes, the cut grade will go down, but in most cases, it pays more for the cutter to opt for a bigger carat. Furthermore, it also happens very often that diamond cutters would want to eliminate a striking inclusion. They do so by cutting it out. But since they also want to preserve more weight, they would risk the diamond cut quality being reduced. Some first-time seekers are duped by fake or unreliable grading reports because they don’t know that you should only look for gems graded by GIA or AGS. Diamond certificates from other grading companies, especially in-house grading reports, are not as accurate and consistent as the said labs. So, to avoid the hassle, simply filter your diamond search with GIA or AGS stones. An AGS 0 isn’t equivalent to a GIA Excellent. Still, they’re both great indicators for cut quality. My top recommendation is to go for the best cut! This means that you should choose a GIA “Excellent” or an AGS “Ideal”. In my opinion, the diamond cut is the wrong place to try to save money! You should only do so on color and clarity as they don’t need to be the highest grades to be the best. Now, if you are really tight on budget, it’s okay to choose “Very Good” for GIA diamonds or “Excellent” for AGS. These grades will still be good, but the increase in brilliance when going for the best cut grade is, of course, much noticeable. 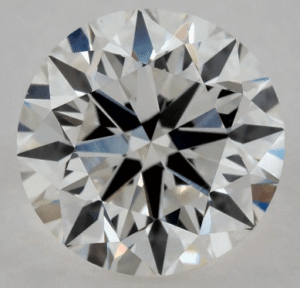 Diamonds with lower cut grades usually look worse than diamonds with higher grades. Another thing you have to bear in mind is that there can be considerable differences between diamonds with the same cut grade. Check out the comparisons below! Both diamonds below are graded “Excellent” by GIA. The one on the left has perfect proportions, while the second diamond's table is too wide making it reflect less light. The next two diamonds below are both graded “Very Good” by GIA. The one on the left has exceptionally good proportions for its cut grade. The gem on the right, on the other hand, might be considered below average for the “Very Good” cut grade. While it’s still an acceptable choice, I would recommend opting for the diamond on the left. The next two diamonds are “Good” cuts. The one on the left is poorly cut and the diamond on the right is a complete mess. Thus, none of these diamonds are acceptable. As you can see, even if two diamonds share the same grade, they don’t have to appear the same. This is because GIA and AGS allow a certain level of variation as long as it's within the specific grade. You’d probably deem symmetry as the more evident distinction and assume that it causes the rise and fall of cut quality. But a diamond that isn’t symmetrical can still be brilliant as most of the diamond’s brilliance is produced by the cut and not the symmetry. An excellent cut and an excellent symmetry go hand in hand. But it’s mainly the proportions between different parameters that determine the diamond’s brilliance. And knowing of these proportions will let you find the best diamond within the same cut grade. It's high time we delve into these features! Table Size The top horizontal facet of the diamond. Total Depth The diamond’s overall depth from the surface of the table to the culet. Pavilion Depth The lower portion from the bottom edge of the girdle to the culet. Pavilion Angle It is the average of the angles formed by the diamond’s pavilion main facets and its girdle plane. Crown Height The upper portion, from the top edge of the girdle to the table. Crown Angle The angle that’s formed where the bezel facets meet the girdle plane. The horizontally projected distance from the point of the star facet to the edge of the table, relative to the distance between the table edge and the girdle edge. Girdle Thickness The middle portion of a diamond, a narrow section separating the crown from the pavilion, and functions as the diamond’s setting edge. Lower Girdle This ratio is measured by calculating how long the lower girdle facets are relative to the length of the pavilion. Culet The small facet at the bottom intended to prevent chipping and to the point. Now, all these parameters must lie within certain limits to get a specific cut grade. 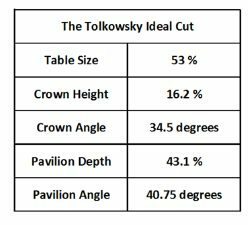 Our grading system today is very close to the Tolkowsky Ideal Cut which was introduced by the mathematician and renowned gemologist Marcel Tolkowsky in 1919. 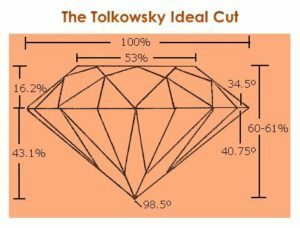 Nowadays, GIA and AGS have slightly modified Tolkowsky Ideal Cut’s proportions for diamonds with Excellent/Ideal light performance. You can find the values on the right. Although please bear in mind that these values should be used as a basic guideline. If you want to know the perfect parameters specifically for a round cut, please read my post on round diamonds here. And if you happen to have your diamond's parameters at your disposal, I would advise to type in these proportions into the free GIA facetware tool. This will quickly tell you what cut grade GIA would rate your diamond! The proportions on the left usually serves a diamond with an Excellent/Ideal cut grade (AGS is stricter than GIA in cut grading). As light travels in and out of the diamond and springs back into the eye of the beholder, the “bling factor” is then created. It's great to know of the specific proportions, but it's also paramount to view your diamond and inspect it from all angles. Currently, James Allen is the only diamond vendor that will allow you to view diamonds in 20x magnification through their revolutionary 360° video display technology. Another fascinating thing is that their advanced filter tool can turn the intricacies of diamond hunting into just a few taps! Aside from cut grades, gemological labs also bestow ratings for symmetry and polish. They’re assigned apart from the cut grade, but they also have a huge impact on your gem's overall beauty! Should you have any questions about Diamond Cut, let me know in the comments section below. Could you help me select which diamond is the better option and buy. I have posted two diamonds below. One from James Allen’s site, which my only concern with it would be the “I” color and one from Four Mine’s site. Could you give me your overall opinion on both and help me make a selection pls!!!! Thank you in advance! I can’t seem to view the fourmine diamond, but the James Allen diamond is within standard round cut proportions except for the table that’s slightly bigger. But seeing the 360-degree video, it’s able to display superb brilliance, it’s eye clean, and I color won’t be noticeable once it’s set on a ring especially a rose gold or yellow gold setting. If you really want a higher color grade, you may opt for a lower clarity grade as anything beyond VS2 will be eye clean. Do you like the Astor Ideal Blue Nile cut? I am thinking of getting a .5 caret, Astor Ideal cut, between F-D color, VVS2-FL clarity, polish very good – excellent, and symmetry very good – excellent. Pretty much trying to get the best diamond and dont want to overpay. Went to Kay and found the Leo with the high end C’s to be double the price. Wondering if Blue Nile is a good company to go and what would your “perfect” C’s would be. A .5 caret that I also like. Sorry for all the comments. Is it worth going Astor Ideal or should I just pick Ideal. You can trust Blue Nile’s quality and value. The Astor is great but you can also just pick Ideal cuts as long as you make sure the diamond is within super ideal cut proportions. The 3rd diamond has the best price and proportions. You can save even more if you look at VS2-VS1 diamonds. They’re known to be eye clean. You may also check out G and F color grades and see if they’re clear enough to you. Hello Sebastian, thank you for your help! I found this “true hearts” cut that does not appear to have the well-defined black star of sparkle in the middle that some of the lesser ideal cuts have. Can you explain why that might be the case and if it is better to go with a less ideal cut that has that black star sparkle in the photo? Thanks! Your diamond has super ideal cut proportions which means its brilliance is topnotch. The hearts and arrows pattern is more on diamond symmetry, and the black color of the arrows pattern is under the diamond cut. It’s behind the scintillation of the diamond because of the perfect contrast of black and white. So, you may look for a better contrast, just stick to the cut proportions above. It’s as good as it can get. Which one of these diamonds do you think would have better fire and brilliance? Both are close to the proportions I have been searching for in a princess cut. The 360 degree videos are of the actual diamonds themselves. In the video for the first diamond (G Colour), I see more dark area in the top view. I’m not sure if this is good or bad. The second diamond has a thinner girdle which makes it more brilliant. While the dark areas in the first diamond are what actually gives it contrast and better fire. So it’s up to you if you’d prefer more brilliance or more fire. But both are excellent diamonds nonetheless! I’m reallt struggling with all the choice but your article has opened my eyes! It seems to meet the specs you gave for super ideal. Many thanks! 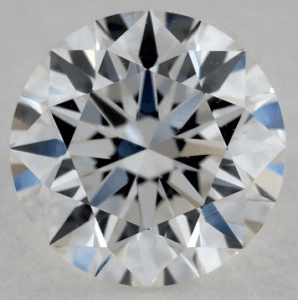 I am looking at a diamond graded by AGS as Ideal Light Performance, Excellent Polish, and Ideal Symmetry, but the Proportion Factors are Good (AGS 4). How can a cut have only Good Proportion Factors but still Ideal Light Performance? Don’t proportions serve light performance? So if light performance is ideal, should that be the deciding factor? That’s a great question! AGS indicates the Proportion Factors grade if the overall cut grade isn’t AGS Ideal O simply for documentation purposes. 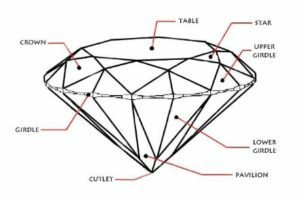 Basically, even if your diamond has Ideal Light Return, it can still receive low proportions grade if the crown angle is too high or the table is too big, or some other proportion factor like pavilion angle, culet size, weight ratio, etc. 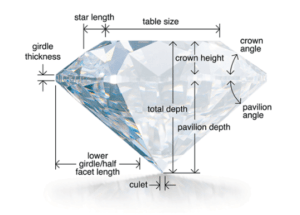 The best way to determine a diamond’s overall beauty is to make sure it is within super ideal cut proportions. If it is, the light return is automatically ideal, plus your diamond will also exhibit great fire and scintillation. I am looking for the details of a master cutter to cut rough stones in Berlin or Barcelona. Can you recommend anyone please? You might want to try Graff or Antwerp, since Antwerp is basically the diamond capital of Europe. Hello, thank you for your time and insights, I want to make myself a solitaire diamond pendant, are these two stones OK (limited budget of 750 euros and buying from France BlueNile is pretty much the only option if you don’t want to get annoyed by money change, taxes and customs!! ), which one would you choose and why? Yes, taxes and customs can be a real pain in the neck! Fortunately, you picked two beautiful ideal cut diamonds. And if I have to choose, I would pick the second one as it has better crown and pavilion angles – the two most important cut proportions in round diamonds. Hello Sebastian. Thank you so much for all the helpful information! I’m looking for a diamond for an engagement ring size 6 white gold. My question is, will there be a huge difference between 1.5 to 1.8 carat? The diamonds you selected are both excellent, good job! Though the Blue Nile diamond has a better pavilion angle by just .2% and it looks a bit whiter because the J color was compensated by the medium fluorescence. There will be a significant difference between the two. In fact, from .20 carat, size difference will be noticeable. Check out James Allen’s carat weight simulator to give you an idea. 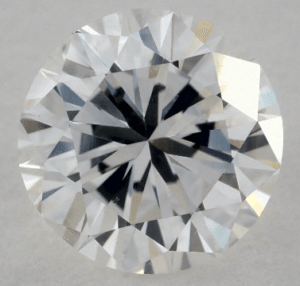 Thanks for the great information.What do you think of a .90 ideal cut, internally flawless, j color, princess shape ring? My only concern is the color. Thanks for all the great info you have provided, this website has been my absolute educator wrt diamond. Could you please help me decide which of the following diamond would you suggest? Thanks for your feedback! The first diamond is much better mainly because it has better cut proportions. It’s not eye clean, but the dark inclusions sort of blend with the diamond’s contrast. I would still recommend finding an eye clean diamond after making sure it’s within standard cut or ideal cut proportions. Until I read this page I wasn’t aware that “cut” didn’t apply to other shapes, in particular oval shape diamonds. 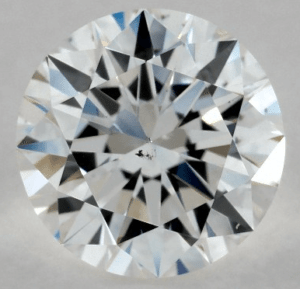 What would you recommend we look for in an oval diamond to ensure it has that same sparkle and effects an “excellent/ideal” cut would have? Do you recommend we ignore the cut on this (open up the filters) as it won’t make any difference to the quality of the diamond? I want a diamond that sparkles best. Looking at the true hearts. which color is the best for a round 1.25 carat I or should i go for a g color. it is going in a yellow solitare with white prongs Thank you! It depends if you prefer an icy-white color or a yellow tint. If you want a whiter color, opt for a G color (or higher if you have a big budget). If you’re okay with a hint of yellow, I or J colors will go perfectly with the yellow solitaire ring. Excellent Cuts give diamonds the best sparkle. Kindly refer to my suggested proportions to achieve the said. Thank you for all of this invaluable information. I’ve learned so much! My husband is buying me a new diamond ring for our 25th wedding anniversary. I sold my original ring to make a mortgage payment during some bad financial times about 15 years ago. I’m so excited but I don’t want to make any mistakes. Can you give me your opinion on the two diamonds listed below? I’m interested in value, but more importantly which do you think would be more beautiful? Also jamesallen thinks diamond A and B are identical so wasn’t sure why I wanted to change at all.. very confused. The 2nd diamond has a better crown angle and since the crown and pavilion angles are the most important dimensions in the diamond cut, I would opt for this one. Although it would still be better if you can find a diamond within the suggested proportions. Based on your article i have narrowed it down to the two following diamonds. Which of the two do you think would be a better diamond and why? Also, are you able to tell me if you think they are eye clean 5″ from the eye please? Would you say the james allen is a true hearts and arrows or not quite? Do you think ill notice the difference between he two or are they familiar similar to the average joe? Both diamonds are cut in super ideal proportions and bear the hearts and arrows pattern. Although the James Allen diamond possesses a dark inclusion at the center, it wouldn’t be visible to the naked eye. 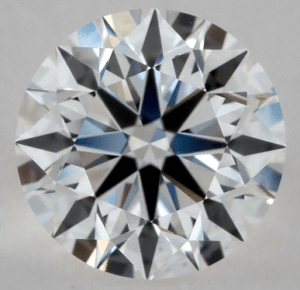 The Whiteflash diamond is slightly better as it has a more balanced cut proportions, but if you look at them without magnification, you wouldn’t be able to tell the difference. Amazing website…all the info anyone would ever need to choose a great diamond! I have used all your recommendations to find something within my budget and out of the following diamonds which one would you recommend for a platinum 1.5mm or 2mm solitaire ring? Thanks for the wonderful feedback. Great choices! The first diamond bears the best cut proportions, so I would choose that one. Regarding the platinum ring, if you want to make the diamond appear whiter, you may opt for a rose gold or yellow gold ring. Oh and would you go for a 1.5mm or 2mm with this diamond? my lady has quite small dainty hands if that helps! Most people won’t go under 2mm for durability reasons, but if it’s a solitaire ring which is a solid ring, and she has small hands, then it’s probably fine. It will also make the diamond look bigger. Ask the James Allen staff as well if you’re getting your ring from them. Platinum is very durable but it needs constant repolishing and is more expensive. So white gold would be a better choice. I just suggested a rose gold or yellow gold if you like to make your J colored diamond appear whiter. But if it looks good to you as is, then opt for the white gold ring. Or should I stick with this.. I think I am going to go for a white gold solitaire if that helps??? Thanks man! No worries Daniel, I’m here to help. 🙂 Stick with the second diamond. It has better cut proportions, symmetry, and contrast that allows for greater brilliance, fire, and scintillation. If you compare the 360-degree video of the two diamonds, you’ll see that your original choice is more brilliant and whiter because it has no fluorescence. I am stressing out a little. I have purchased a ring and am all set to propose. I purchased it from James Allen and it is a True Hearts Diamond. I will provide the link to the stone. 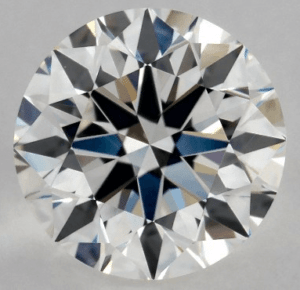 My concern is I utilized the HCA tool to narrow down some diamonds and chose this one because it scored a .6 and I initially thought that must be a good thing, however now I am ready you should aim for 1-2. The idealscope looked great I thought and it looks nice in person, but I am worried I sacraficed on fire. The HCA should only be used as a rejection tool and not as a selection tool. What you should consider is the cut proportions. And if you’ll check my cut guide above, your diamond’s specs are within super ideal proportions. This means your diamond will exhibit high quality of brilliance, fire, and scintillation. Good choice! Hi Sebastian, Thank you for opening my eyes as I’d always just assumed color was most important!! 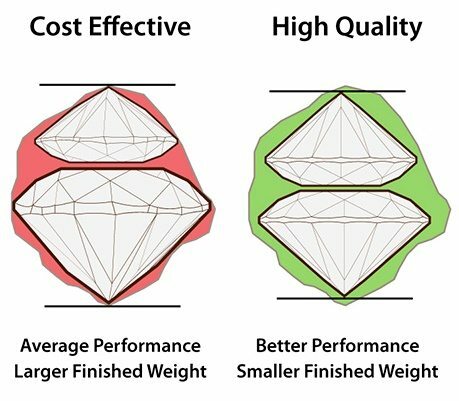 In terms of the proportions for the super ideal round cut diamonds I wanted your advice. How would you rank the below 6 in terms of importance when it comes to the sparkle of diamond. (I assume to give most importance to pavilion and crown angle)? Glad to be of help! To answer your question: The most important factors are the crown angle and pavilion angle. The crown angle should be between 34.0° and 35.0° and the pavilion angle between 40.6° – 41.0°. The perfect proportions to maximize fire and brilliance are right in the middle with 34.5° for crown and 40.8° for pavilion. You can also counterbalance a slightly higher crown angle with a slightly lower pavilion angle and vice versa. These two are followed by the table, depth, girdle, and finally culet. Thank You Sebastian, could I get your thoughts on the below please? 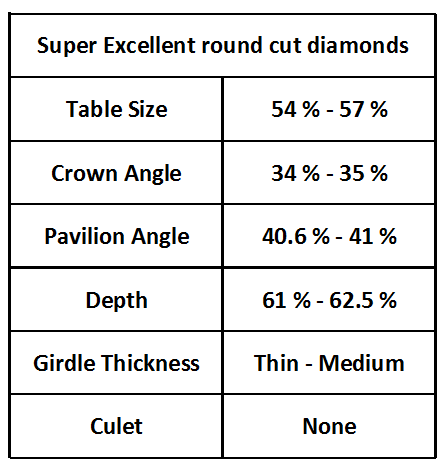 Basing from the cut guide I provided above, your diamond’s specs are within the standard round cut proportions except for the table. I would advise sticking with the suggested parameters. However, if you’ll be able to view the diamond under a loupe and see that it has a good light performance and is eye clean, then it’s just a matter of personal preference. 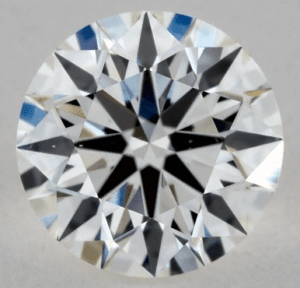 I’ve been told to go for the below diamond as my centre stone however i note it only matches 3 of the 6 ideal specs and also the comments in the clarity characteristics field worries me. Could I get your expert advise please. I would prefer a diamond within the standard cut, if not ideal, proportions. But another important thing is to make sure it is eye clean. Since the grading report don’t take note of the color and intensity of inclusions, it’s best to see your diamond under a loupe or through magnified photos. Just wondering what your thoughts are on this diamond on a Rose Gold setting (but claws are white gold). Also, 14 or 18kt rose gold? Thanks!! The I color will go well with either white or rose gold. Also, 14k is more favorable because it appears to be more pink due to the heightened amount of copper. I went for the below in the end could you let me know your opinion please? I’m a little disappointing as it doesn’t fit exactly in the super ideal measurements but went for it as jeweler highly recommended it and said it would look good with my tapered band gone for. It’s also out of the standard round cut proportions. If it’s eye clean, it would probably look good, but a diamond with a better cut will sparkle and appear more brilliant. Hi Sebastian, was hoping you can help me….I don’t have much money to spend, so have been looking here for an engagement ring…. Or am I better going for smaller carat (0.30) but SI1 Clarity? As they are about the same price. 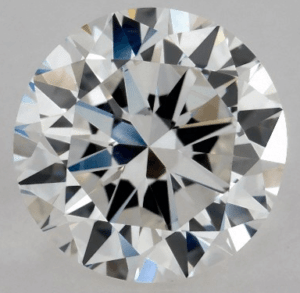 I know they are not expensive or big, so was wondering on a diamond that size whether the clarity or cut or carat weight or colour are the things to prioritise….or in what combination. Cut is the most important aspect as it determines the sparkle of the diamond. A great cut can make your diamond appear brighter than a bigger poor-cut stone. So it’s best to stick with excellent cut. G-I color is suitable to your diamond’s carat weight. Just make sure it is eye clean (or you can’t see visible flaws) and you can go as low as I1. If there’s no eye clean I1 then maybe you should opt for the 0.30 diamond. Was thinking about this one, but the crown angle is a bit outside. What do you think? Hi Rico, the crown angle is a bit outside super ideal cut proportions but it’s within standard cut, and all the other diameters are within super ideal, so it’s still great. Thanks for all the helpful information on your website. We are looking at a ring that is 1.26 round F, VS2, GIA 3EX, no florescence, proportions are Table 60%, Depth 60.7%, Crown Angle 35.0%, Pavilion Angle 41.0%, no cutlet. The ring has two pear-shaped side stones, and it’s priced at ~$25K. Would you please advise if it’s worth to buy? Thanks for all the tips on your website. We were just at a jeweler’s and have decided on this diamond (GIA excellent) but after researching, have noticed that it’s slightly outside of your recommended specs. Appreciate your advice if this is a good diamond to get and if we will be compromising on the brilliance and fire. Thanks! Proportion seems to be good, and it is clear when viewed with eyes. What do you think? Hi!! What do you think of the proportions of this diamond? Looked extremely sparkly and eye clean at the store to me. The diamond has super ideal cut proportions if not for its slightly thick girdle, but an exquisite diamond nonetheless! Is a high quality cut as important for other diamond shapes, such as emerald and marquise? How would I be able to tell the quality of the cut for emerald and marquise shapes? Thank you! What about Oval cut diamonds? Would you recommend this GIA certified diamond? The only thing putting me off is the lower half being 75%, I’ve heard it’s ideal to be 80%, is this correct? What you should be taking note of are the crown and pavilion angles as they’re the biggest contributors in the diamond’s sparkle. And upon checking your diamond’s specs, its proportions reveal that it is a super ideal cut except for the girdle, but still an exquisite diamond nonetheless. Just make sure that it’s eye clean. HI Sebastian, I’m trying to decide between GIA 2238801731 and 6242029719. We saw them in the store and the smaller one 1.3c had visually less color than the 1.4c but only when compared next to each other. The price is only different by a couple hundred so i can go either way. Let me know your opinion on what would look best to the naked eye on a 6-prong solitaire setting. The crown angle and pavilion angle are the most important features in determining the light performance of a diamond. The most balanced combination (in terms of brilliance and fire) would be 34.5° as a crown angle and 40.8° as a pavilion angle. We have 2238801731 with a 36.0° crown angle and a 40.6° pavilion angle, and then we have 6242029719 with a 33.0° crown angle and a 40.8° pavilion angle. The 36.0° crown angle is very steep and the 33.0° crown angle is very shallow. For a steeper crown angle, you want a shallower pavilion angle, and for a shallower crown angle, we would want a steeper pavilion angle. In this particular case, the steep crown angle of 36.0° is counterbalanced by the shallower pavilion angle of 40.6°. The other diamond with the shallow pavilion angle of 33.0° is not so well counterbalanced by the medium pavilion angle of 40.8°. Also, if in doubt, a steeper crown angle is to be preferred. The overall light performance of Diamond 2238801731 should therefore be better. Hey Sebastian, I have a question for you. 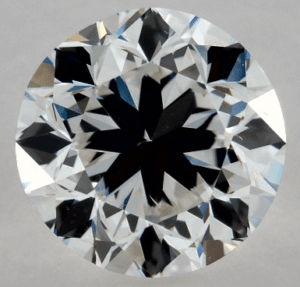 I’m looking at this diamond which has great proportions, it scored a 0.6 on the HCA tool. I noticed on the tool it said scores between 0-1 are not usually best for rings. scored 1-2 was recommended. Can you have a look at the cut of this diamond and tell me if you think its a good choice. The HCA is just a rejection tool, not a selection tool. We only use it to weed out poor performing diamonds. That’s a super ideal diamond you got there! Hello Sebastian – Do you believe this diamond is worth its list price? What are your thoughts on the cut? Although it has a slightly thick girdle, it is within the super ideal cut proportions, and it scored 1.4 in the HCA tool which means it has excellent visual performance. And compared to other diamonds with the same specs on James Allen, your diamond bears a better price and symmetry. If my key decision making driver is the cut factor and how brilliant the diamond is under the light, can you please suggest me which diamond should I choose base on those reports? Since I’m gonna by online, so can’t compare these 3 diamonds in person. All three have ideal dimensions, but diamond number 2’s proportions fall within the super ideal cut parameters. I would still recommend viewing the diamond in HD imagery, if not in person, so you’ll really know what you’ll be getting. Goodluck! Hi Floyd, I would choose 2514539 as it has a more proportioned depth which also makes it super ideal in all aspects. how do you explain in simple terms that GIA excellent – ideal – and others may not be true hearts and arrows, to sales at different web sites or do they know and keep pushing their cut. Hearts and Arrows diamonds represent the pinnacle of cut precision. A diamond can bear super ideal cut proportions, but to be labeled with the H&A pattern, it also has to have superior light performance from precise optical symmetry. It’s true that there are unreliable vendors that brand their stones as H&A even if it’s not passable, but websites like James Allen have a separate filter for H&A diamonds, and most legit shops would provide you with ASET, Idealscope, H&A images to justify the name. My diamond is 1.05 Emerald Very Good Cut with G color & IF clarity. 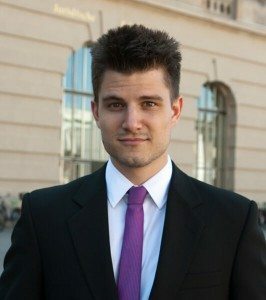 Is it OK to go with Very Good Cut instead of Excellent? This ring has the specs I like, so I am leaning toward this one, but know cut is important & don’t know how different a VG vs. Excellent would be in this case. Also, polish is Excellent and Symmetry is VG. Sorry last question. Also for the ring, does it make sense to pay $450 for better side diamonds? They are very small. The ring is a 14k rose gold using white diamonds 1/2 way down the shank that are VS/F-G grade diamonds is $2,189. If you want to use SI/H-I grade white diamonds instead, the price is $1,745. Would it depend on how good the color of the center stone is? The first diamond is closer to the super ideal proportions of table (54%-57%) and depth (61%-62.5%) and I would initially go for the best cut possible. But if you’ll compare the first and second diamonds and don’t notice any difference in fire, brilliance, and scintillation, then you may opt for the second one since G color is also bright and is much cheaper. I am looking at a pair of antique diamond stud earrings circa 1900 total carrat weight of .89. They are described as having an Old European Cut Si1 clarity, I-J color . What can you tell me about that older cut? Any idea of what would be a good price? The Old European Cut is an antique cushion cut diamond. This article will best explain the cut to you. Cheers! Which one would be better choice? They are about same price in my budget. I could go for G color and vs clarity with excellent cut but I want to have colorless diamond. Please let me know your opinion. Thank you. The golden rule is to opt for the best cut possible, so the second option seems to be a better choice, especially if they are price the same. Just make sure that it’s eye clean, since it’s SI1. 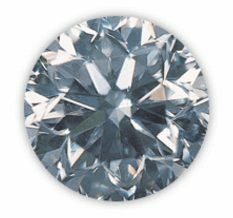 Although, I would still recommend a G-VS with excelelnt cut because a G colored diamond will look as colorless as a D when set on a ring. You can’t imagine how did you save my a** yesterday from being cheated. That is because i just had a quick look on your articles few minutes before payment.. thanks a lot. Currently, i gotvan offer for a loose diamond h color, vs1, cut and sym excellent, pol is vgood. Flur is none. Depth and table are within range. But girdle thickness is slightly thick. Glad to be of help! 🙂 Girdle thickness is important because if it’s thin or extremely thick, it would make the diamond prone to chipping. According to GIA’s Girldle Assessment, as long as your gem has a thin/medium – slightly thick girdle, it could receive an excellent cut grade. All your other specs are of high quality, just make sure your stone is eye clean. Unfortunately, I won’t be able to compare prices without your carat weight info. Why don’t you type in your specs in James Allen’s filter tool to see how much diamonds are priced with your 4Cs? Let me know how it goes! Your ports are very helpful. Can you explain what’s important for cushion cut diamonds? I am currently looking at 1 caret with H color VVS2. Also how does cushion modified brilliant differ from standard cushion cut. Glad to be of help! For cushion cut diamonds, make sure that the table and depth is 61-67, the girdle is thin to slightly thick, and there’s no culet. The most popular legth to width ratio is 1.10 to 1.20. And since it’s 1 carat, it’s best to go for the D-F color range, and FL to VVS2 for clarity. There’s also what we call cushion brilliant based from the faceting of round brilliant cuts. Since it resembles the super ideal shape, it’s deemed more popular than the standard cushion cut and the cheaper cushion modified brilliant that bears a crushed ice appearance. I have found your site very informative. I was wondering if you could please give advice/your opinion on the two diamonds below? Thanks for your feedback. 🙂 If you’ll go back to my super ideal round cut proportions in this article, you’ll see that the GIA diamond has better crown angle and pavilion angle proportions. Cheers! We looked at a princess cut diamond he really likes its a GIA D ,vvI (I think) but sematry was fair should he stay away? The golden rule is to choose Excellent/Ideal cut diamonds to achieve superb sparkle. And a diamond with an excellent cut has to have “Excellent” or at least “Very Good” symmetry as well. That said, I would advise you to go for a “Very Good” symmetry grade. These diamonds include symmetry flaws that can only be seen face-up at 10X magnification. 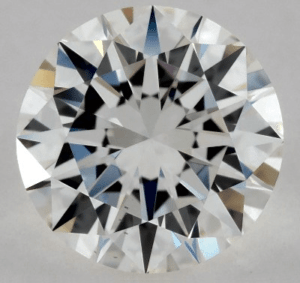 While diamonds with only “Good” symmetry grades might exhibit flaws that can be viewed by the naked eye. Such diamonds will never receive an “Excellent” cut grade. What more for “Fair” symmetry grades, right? What are your views on buying a d colour emerald cut diamond, .80 ct, vvs2 clarity. Since only round and princess cut diamonds have cut grades, is there anyway to determine how well cut a pear shaped diamond is, for instance? 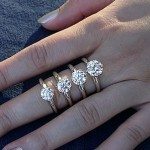 Do you recommend buying from bluenile or a local dealer? I heard Blue Nile marks up 20% compared to actual stores. I haven’t heard of the 20% markup, but diamonds bought at Blue Nile are cheaper than diamonds bought at a brick and mortar store because they have lower operating costs. Thus, I would prefer Blue Nile to a local dealer. I aslo recommend other online shops like James Allen because of better functionality including high definition videos. Blue Nile recently introduced a 360-degree diamond view, but it only applies to a small percentage of their collection. I’m looking at a GIA CERTIFIED G color, FL, EX cut, EX polish, EX symmetry, 1/2 CT round brilliant stone. At the store & at church it sparkles like nothing I’ve ever seen. In regular daylight, it doesn’t do much. Nor does it seem to do much in regular everyday lighting: office, living room, cloudy day, etc. What am I missing? Where is the sparkle, the brilliance, the wow? Just for reference, my numbers are: depth 61.8, table 55, crown angle 34.5, pavilion angle 40.8, girdle medium. Where did I go wrong? I think that it has ideal proportions. A 34.5° crown angle combined with a 40.8° pavilion angle are as good as it gets. It definitely maximizes both brilliance and scintillation and thus, it should be a really sparkly diamond. The thing is, diamonds always sparkle best at jewelry stores because they tend to maximize the instore lighting. And direct sunlight isn’t the best lighting for excellent cuts, but it can make average or poorly-cut gems look outstanding. 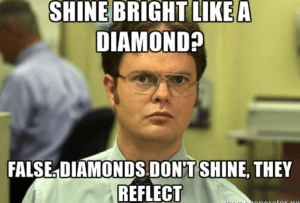 Also, the slightest bit of grease or dirt on a diamond will change the way it reflects light and greatly dim its sparkle. But what you can do is, you can clean your diamond with dish soap and a toothbrush every day to achieve maximum brilliance. Hello Sebastian, I am suprised not to find the very important baguette shape on your page? Why don’t you mention it? Up till now I was mainly concentrating on round cut diamonds because they are the most popular. But I will get around to writing on the baguette shape within the next week! Thank you for sharing this wealth of information on the diamond cut! I will make sure to get the best possible cut. I really think that this is the best decision you can make to go for the best cut and compromise on color and clarity if necessary! I know that the diamond cut is very important. 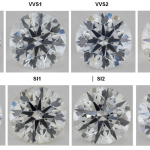 Do you think GIA or AGS graded diamonds are better? in fact AGS is a little bit stricter than AGS for giving its highest cut grade. However, GIA is generally stricter in terms of color and clarity. You can make sure that your diamond has a really good cut by making sure that is is within the super excellent proportions. However, it will be difficult to make sure on your own what kind of color grade your diamond has. As GIA is stricter in terms of color and clarity I would prefer to go for a GIA graded diamond. However, both GIA and AGS graded diamonds are absolutely fine! What about GIA triple excellent graded diamonds? Are they the best choice with the best diamond cut? In my opinion you should not blindly trust the label GIA triple Excellent but still check out whether the diamond has superb cut proportions. At least if you want to have a diamond with the maximum amount of sparle. Many GIA triple Excellent diamonds do not fall within these super excellent proportions and thus you must actively look out for them! What are the best diamond cut parameters for a princess cut diamond? please have a look at my post on princess cut diamonds. You can find it via Diamond Shapes/Princess cut diamonds. Sebastian you have a great detailed post about the diamond cut. So you mean to say that I should not choose any diamond that does not lie within these excellent proportions? yes the diamond cut is really important. When buying a round cut diamond you should definitely make sure that it is at least within these parameters. (You can also find it under Shapes/round cut ciamond). I do know that it is some work to check out every single grading report but all this effort will definitely pay out! Thanks for all the information that you have provided. 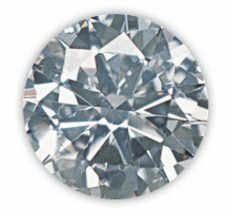 Could you check this diamond from jamesallen : https://www.jamesallen.com/loose-diamonds/round-cut/0.46-carat-f-color-vvs1-clarity-excellent-cut-sku-1128442 . Is this a good stone for the money?